What do the buildings surrounding the Baltic Sea look like? If our recent cruise experience is a valid sampling, the answer depends very much on the area you are examining. I am by no means a scholar of architecture (as I will prove shortly) but even I could see distinct trends. Our cruise began in Stockholm and ended in Copenhagen. These two cities are at the western end of our itinerary and the facades of the buildings looked rather similar. The steeply pitched roof lines and the fronts of buildings reminded me of Amsterdam. All three cities open onto the shared watery highway of the North Sea and the Baltic, so it makes sense that designs should change only by a small degree (to the casual observer, anyway). Our first port, Tallinn in Estonia, is also on the Baltic, but the historic city center looks positively medieval. Thinking about it now I wonder how hard it was to introduce plumbing and electricity into these buildings of creamy stone which have stood for centuries. The streets in the historic center of Tallinn retain their medieval appearance. 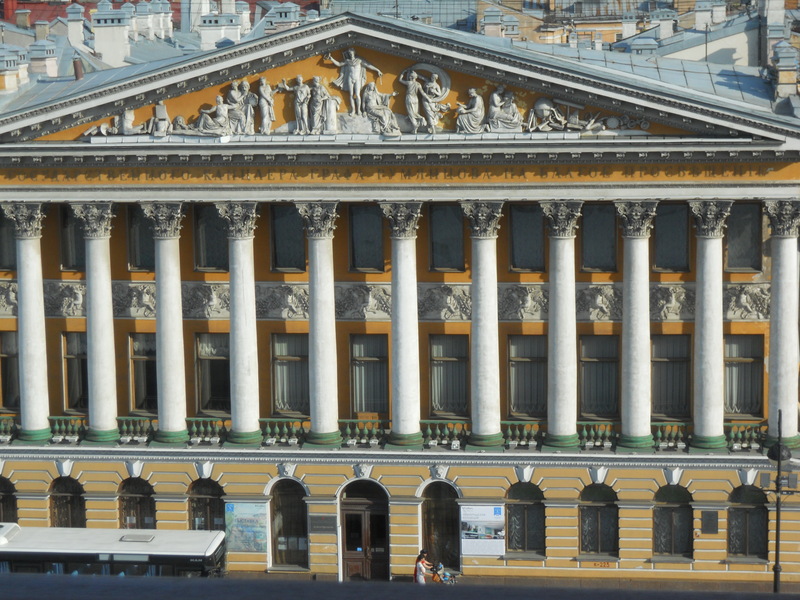 St. Petersburg was obviously the showpiece of the Czars in its heyday. Peter the Great wanted the city and all of Russia to connect more energetically with the rest of Europe. Under his influence wonderful palaces were constructed by many members of an extended noble class. The showpiece buildings which grace the riverfronts are decorated with columns and pediments, and lots of gold leaf and pastel paint. I would call this neo-classical. One guide said this is Russian Baroque, which means the ornamentation is larger than it would be in other regions; it certainly is extravagant. Our ship was docked across the street from this grand building. 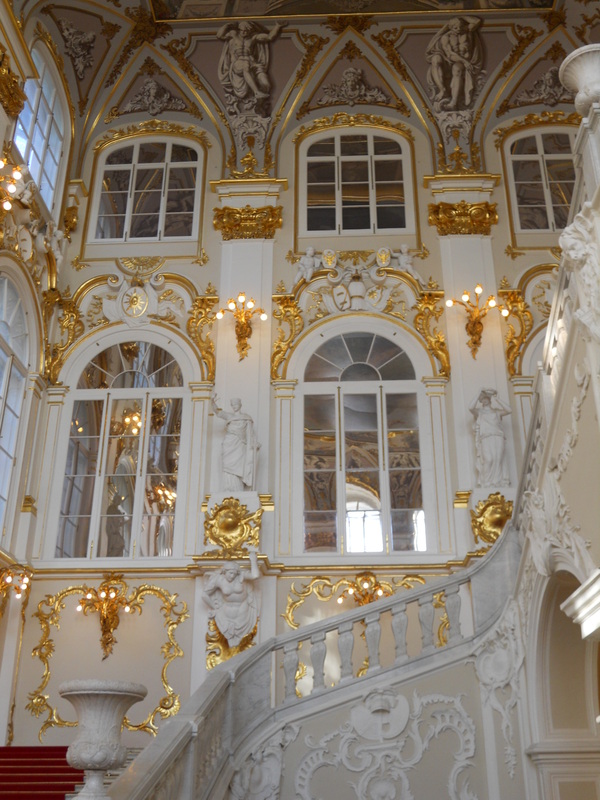 The grand staircase of the Hermitage leads to even more treasures. Another, older line of architecture is obvious in St. Petersburg also. The Church of the Savior on Spilled Blood* reminds me of St. Basil’s cathedral, the icon of Moscow. Here multicolored onion domes dominate the outside. 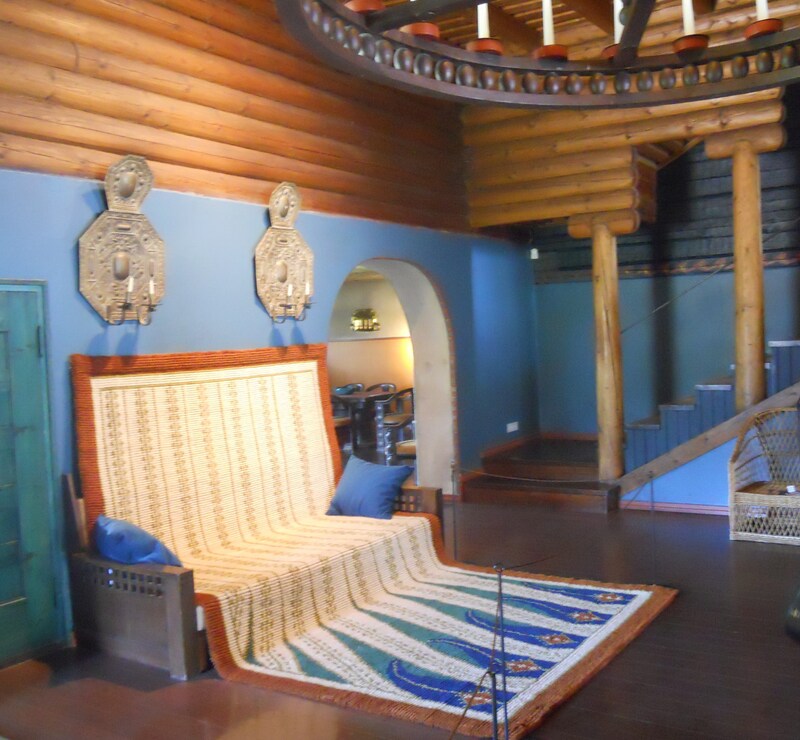 Byzantine influence clearly rules the interior also. Flat, iconic saints with gold halos bless from the mosaic walls. 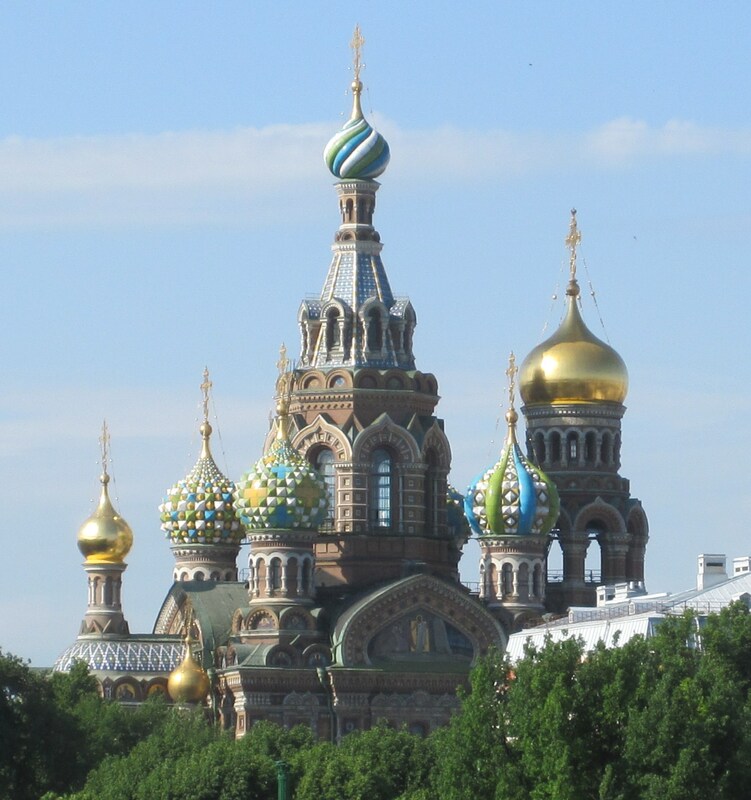 This view from a distance shows off the elaborate towers of the Church of the Savior on Spilled Blood. The interior of the church has been gloriously restored after decades of neglect. From Byzantine and Baroque St. Petersburg, we went to modern Helsinki. A Lutheran church we visited here was about as far from Byzantine as you could get. The Church of the Rock (Temppeliaukio Church) was cut from a solid rock mound. The interior is very simple; the rock walls are uneven and look almost unfinished. The ceiling/roof is a copper dome, held up by beams to let in lots of natural light. The church is known for its excellent acoustics and frequently serves as a concert venue. The abundant, natural light is a surprising feature in the sanctuary cut from stone. The carpet covering this couch was quite soft. It was designed to be pulled up as a lap robe. What is typical architecture around the Baltic? It depends on which Baltic estuary you sail into, and there probably is a big difference between the historic city centers and the contemporary suburbs which we did not see. All are authentic to their place and time but so amazingly different! There is no substitute for seeing the variety in person. * The “Spilled Blood” in the church’s name refers not to Jesus but to the Czar Alexander II, assassinated on that spot in 1881. This entry was posted in Travel, Uncategorized and tagged architecture, Baltic, Church of the Rock, Church of the Savior on Spilled Blood, Eero Saarinen, Eliel Saarinen, Helsinki, St. Petersburg, Tallinn, travel. Bookmark the permalink. Just beautiful. I have a question for you, if you wouldn’t mind – I’m starting college in Europe, and over Christmas I’m planning on about four days in Russia. I’m currently debating between St Petersburg and Moscow…would you recommend St. Petersburg (I love history, if this helps your recommendation). Thank you so much, love your blog! Four days in Russia in December. Are you sure?! Just kidding. I expect you have considered the weather. Both cities will be cold so you might not feel like spending hours walking the city. Which periods of history are you more interested in? 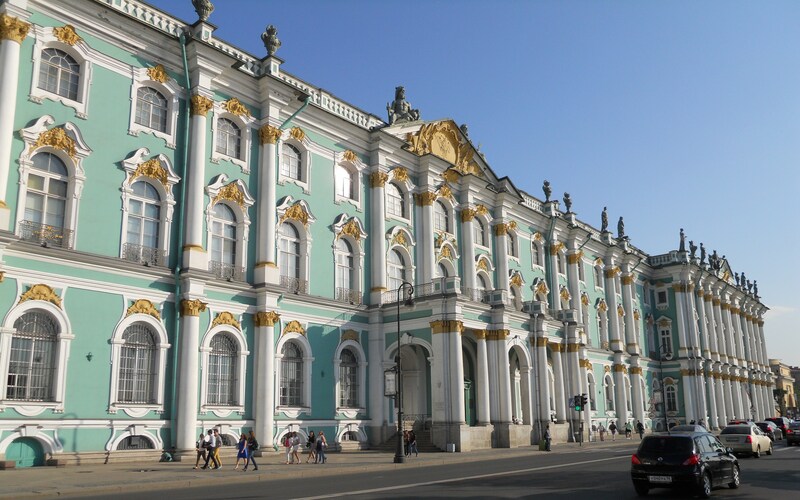 Certainly St. Petersburg has loads to show you from the 1700s to the early 1900s. The capital was moved to Moscow after WW I (1918). If you are interested in the earlier times, go to St. Petersburg. If the Communist/USSR period of the 20th century is more interesting to you, Moscow would offer you more. I have not been there so I have no idea what Moscow offers from the earlier times. Your fellow students can probably inform you well on which they consider a better visit. It will be fascinating either place. Thanks for writing! Don’t worry. I will be wrapped in one billion layers – but I always wanted to go to Russia in the winter! I love all history, which doesn’t help at all, but I do love the earlier periods – perhaps I’ll do St Petersburg this year then! Thanks so much, I really appreciate it…I expect this won’t be the last you hear from me…I apologize! No problem! Keep in touch, and enjoy Europe.